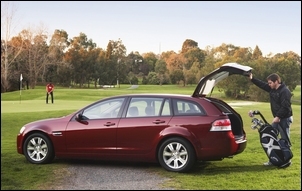 With the development of the VE Commodore wagon (dubbed ‘Sportwagon’), Holden chose to step away from the hearse-like proportions of the previous wagon models and instead embrace a much less commercial-vehicle orientation. Unlike recent previous Commodore wagons, the Sportwagon uses the same wheelbase as the sedan, and the swept-down roofline and inset hatch hinge point (it’s a long way forwards from the trailing edge of the roof) make the look and feel of the wagon quite different to previous Commodore designs. 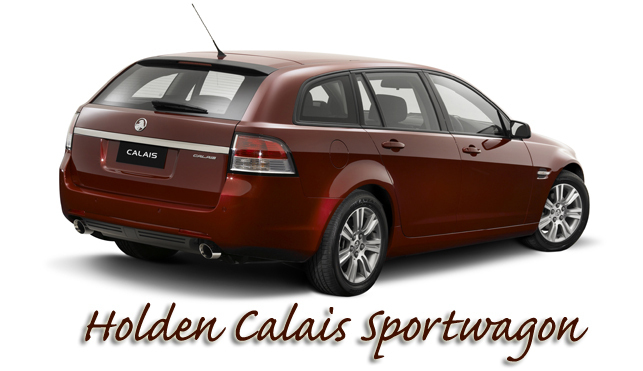 Over and above the sedan, the wagon version cost Holden $110 million and 513,500 extra test kilometres. Let’s start at the back of the car, one we drove in the Calais version. The large tail-gate opens on two gas struts, the top edge of the open hatch high enough to avoid the heads of average height people. However, for reasons not entirely clear, small people found closing the hatch rather awkward – perhaps the springing of the struts is too stiff, or the forward hinge point makes the motion un-natural. 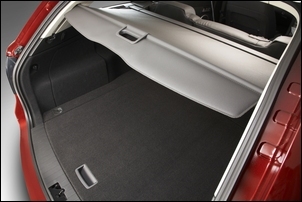 A benefit of the rear hatch design is that access to the interior is excellent. Under the floor of the test car was a ($350 option) full-size alloy spare wheel; to access it, the thick, strong floor panel is securely held in its raised position by a hook and cord (that pulls upwards) and a strap (pulling downwards). Four cargo tie-down hooks are provided, and the cargo blind can easily be removed or retracted. Two fold-down grocery bag hooks are fitted, as is a 12V socket. In this Calais model, a cargo net was also provided. Child restraint anchorages are integrated into the seat backs, so no intrusion occurs into the cargo area when child seats are fitted. The rear seats 60:40 spilt-fold downwards, giving a dead-flat floor. Folding is easy and quick. The resulting space is a bit deceptive: it looks smaller than it is. Holden claims “almost” 2 metres of length is available but with the front seats set for normal height occupants, it’s considerably less than that – however, if the desire strikes, there is still room for two adults to sleep there. We also fitted a large conventional bicycle in the back without the need to remove a bike wheel. With the rear seats erected, there’s 895 litres of useable volume – with the seats down, this jumps to an even 2000 litres. In short, the cargo section of the car is practical, useful and well designed. Moving forward, the car is largely generic VE Commodore. 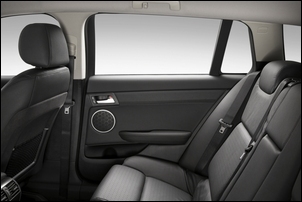 In the front seats there is an enormous amount of room – knee-room, foot-room, side space and headroom. The door pockets are large and include bottle holders. The centre console includes two cupholders and a sunglasses compartment is integrated into the roof. The glovebox is large but neither it nor the centre console are air-conditioned – something the case now in many much cheaper cars, and a feature you’d think Australian car manufacturers would have been the first to adopt, not the last. In the Calais both front seats are electric, with the driver’s having memories but with these knobs bizarrely accessible by feel alone. There’s also sprawling space in the rear seat. In fact, headroom in the Sportwagon is greater than in the sedan, while room in all other directions is fine. Large rear door pockets (again with bottle holders) are provided and dual cup-holders pop out from the central leading edge of the seat. 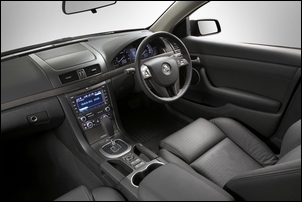 A fold-down armrest is fitted and the rear occupants are ventilated by rear-of-console vents. From the driver’s seat, the controls and instruments are clear and easy to understand. After a little initial familiarity, the steering wheel controls work exceptionally well. The steering is reach- and height-adjustable. The central colour LCD is effective but the absence of a reversing camera (it’s an option) and navigation (ditto) are disappointing in a car of this AUD$47,290 price. In fact, despite being fitted with rear reversing sensors, the missing camera is a serious shortcoming – smaller drivers we had in the car complained of difficulty in parking the vehicle, despite the fact the same drivers had no problems in the VE sedan and ute. Visibility for the driver is also impaired - as with all VE Commodores - by the very thick 'A' pillars. On the road, the steering of the Sportwagon was a little slower around centre than we remember from previous VE Commodores. But if anything, we found this trait more suited to a family car than the sharp turn-in of the other cars. Rear suspension of the wagon has been modified over the sedan with a reduced anti-roll bar diameter, increased toe-link stability and revision to ball joint numbers. Tyres are 255/55 Bridgestone Turanza on 17 inch alloys. The handling of the Sportwagon didn’t seem as precise as the sedan, with a trifle tail-heavy feeling (we know why the sway bar diameter was reduced!). However, in the context of family cars and Australia’s strictly enforced speed and driving style laws, the handling is very good. Safety is in the four-star crash test class, with front, curtain and side impact airbags. Electronic stability control is standard. The Calais is fitted with the ‘high output’ engine – this has dual exhausts, 195kW at 6500 rpm and a peak torque of 340Nm at 2600 rpm. It’s backed by a 5-speed auto. On the open road the engine at times struggled to push the 1840kg wagon with the expected ease – even on small hills, the trans often needed to drop a gear to maintain speed. That’s not to say that there is insufficient full-throttle performance, but an engine with more torque (and, if necessary, less power) would work far better in most driving situations. Considering the size of the vehicle, the fuel economy was quite acceptable. In order to improve economy, Holden has been making some changes to the V6 engines fitted in their line-up – although apparently not to the high output engine in the Calais. But even so, the car returned consistent city fuel consumption figures of 11.5 – 12.0 litres/100km, and on the open road 9.0 – 10.0 litres/100km. Especially in the city consumption, this is better than we have previously seen with VE Commodores driven in the same conditions, and was achieved over an extended period of three weeks. Compared to a petrol-powered SUV with similar interior space, the Sportwagon stacks up very well in fuel economy, ride, handling and performance. Compared to a diesel SUV, the fuel economy / performance comparison becomes more marginal. A diesel-powered Sportwagon, with better bottom-end torque and perhaps 30 per cent improved fuel economy? It’s rumoured to be coming – and that would surely be an excellent car. But as the Sportwagon stands now? For those who want a very large, practical and effective car, it’s a good choice. 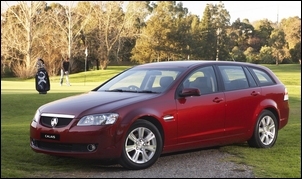 The Holden Calais Sportwagon was provided for this story by Holden. To improve fuel economy, why not just reduce the amount of fuel that's injected?